In Modern C++ Design , Andrei Alexandrescu opens new vistas for C++ programmers. Displaying extraordinary creativity and programming virtuosity, Alexandrescu offers a cutting-edge approach to design that unites design patterns, generic programming, and C++, enabling programmers to achieve expressive, flexible, and highly reusable code. This book introduces the concept of generic components—reusable design templates that produce boilerplate code for compiler consumption—all within C++. Generic components enable an easier and more seamless transition from design to application code, generate code that better expresses the original design intention, and support the reuse of design structures with minimal recoding. For each generic component, the book presents the fundamental problems and design options, and finally implements a generic solution. In addition, an accompanying Web site, http://www.awl.com/cseng/titles/0-201-70431-5, makes the code implementations available for the generic components in the book and provides a free, downloadable C++ library, called Loki, created by the author. Loki provides out-of-the-box functionality for virtually any C++ project. 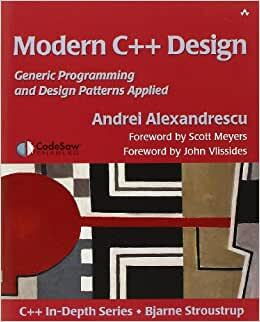 Andrei Alexandrescu is the author of the award-winning book Modern C++ Design (Addison-Wesley, 2001) and is a columnist for C/C++ Users Journal. The Multiplicity of Software Design. The Failure of the Do-It-All Interface. Multiple Inheritance to the Rescue? Optional Functionality Through Incomplete Instantiation. Customizing Structure with Policy Classes. Decomposing a Class in Policies. Local Classes 28 2.4 Mapping Integral Constants to Types. Detecting Convertibility and Inheritance at Compile Time. Erasing a Type from a Typelist. Replacing an Element in a Typelist. The Default Free Store Allocator. The Workings of a Memory Allocator. Simple, Complicated, Yet Simple in the End. Command in the Real World. The Functor Class Template Skeleton. Build One, Get One Free. Argument and Return Type Conversions. Handling Pointers to Member Functions. Real-World Issues I: The Cost of Forwarding Functions. Real-World Issues II: Heap Allocation. Implementing Undo and Redo with Functor. Static Data + Static Functions != Singleton. The Basic C11 Idioms Supporting Singleton. Addressing the Dead Reference Problem (I):. Addressing the Dead Reference Problem (II):. Living in a Multithreaded World. SingletonHolder Class Template Quick Facts. Implicit Conversion to Raw Pointer Type. Smart Pointers to const and const Smart Pointers. The Need for Object Factories. Object Factories in C11: Classes and Objects. Using Object Factories with Other Generic Components. Factory Class Template Quick Facts. CloneFactory Class Template Quick Facts. The Architectural Role of Abstract Factory. A Generic Abstract Factory Interface. A Prototype-Based Abstract Factory Implementation. AbstractFactory and ConcreteFactory Quick Facts. An Implementation Refinement: The Acyclic Visitor. A Generic Implementation of Visitor. Back to the Cyclic Visitor. Visitor Generic Component Quick Facts. Symmetry with the Brute-Force Dispatcher. Converting Arguments: static_cast or dynamic_cast? BasicDispatcher and BasicFastDispatcher as Policies. Appendix A. Minimalist Multithreading Library. Atomic Operations on Integral Types. Locking Semantics in Object-Oriented Programming. Semaphores, Events, and Other Good Things. The material presented in this book is mainly for library writers and senior developers who are in charge of software design. Having said that, the material here is unlike you'll find in any other book. Author discusses design and implementation of reusable components like a (very sophisticated) singleton, visitor, generalized functors, smart pointers, etc. I found discussions on smart pointers and singleton to be particularly enlightening. Its amazing how a simple design pattern like singleton could have so many intricacies. But the chapter which blew me away was that of typelists, and what author achieves by using simple metaprogramming constructs (although I would be the first one to admit that a mere mortal software developer like myself would not be using typelists everyday, but its still fun to learn about them). This book is very different from whatever material I had read earlier on C++. Do read this book once you are familiar with topics like templates, common design patterns and smart pointers. This was quite fantastic. However it is dated because his concepts got rolled into C++ 11, 14, 17. Never has a professional/technical book made such an impact on me. I remember reading this book for the first time about 7 yeas ago and feeling my head turn inside out. Upon re-reading it recently I found it exciting and very understandable. The techniques outlined in this book solve problems that no other techniques can resolve. I find it amazing what can be done with classes and functions that never even get constructed. Definitely gives a good coverage for all aspects of Meta Programming I think one of the measures of respect by which this book is regarded is how many of these pioneering techniques have made It into the Boost library. Thoroughly recommended for the intermediate to advanced programmer to have in his library. Even if you don't use C++. Many years ago, I began to feel that the power of templates in C++ has not been fully exploited. In more recent years, the emergence of the STL has shown that templates can be used to great advantage for containers, allowing conceptually simple generic implementations to be reused in a wide variety of situations, with no run-time penalty. This advance only increased my sense that we haven't yet seen the full power of templates. Alexandrescue's remarkable work is, in my view, the most original and important advance in C++ since the STL. It has been an article of faith in the design patterns community that one can't implement a reusable design patterns library in any language, because each pattern has dozens of important variations, and an unlimited number of custom variations, all seemingly interdependent. Alexandrescue's work seriously challenges this assumption. He uses "policy classes" (explained in Chapter 1) together with many innovative template techniques to pull apart these interdependencies. The heart of the book describes in detail how he developed the "Loki" library containing many gang-of-four design pattern implementations. Loki's SmartPtr, one of the high points of the book, puts to shame the Standard C++ auto_ptr, which has been the state of the art until now. Even before Alexandrescue's work, templates provided C++ programmers with major advantages not available in "more modern" object-oriented languages such as Java and C#. Alexandrescue multiplies the existing advantages many times, facilitating dramatic increases in C++ programming productivity and quality. Isn't that what high-level language programming is all about? The only negative comment I have is not really a criticism of Alexandrescue's work, but of the deplorable state of C++ compiler implementations. Because many C++ compilers, especially the most popular ones, still do not fully support Standard C++, many of Alexandrescue's techniques cannot yet be used in many practical situations. I would like to think that the importance of supporting Alexandrescue's library will motivate compiler vendors to make the necessary, and long-overdue upgrades.